1983 Joins E.S. Jacobs & Co. Throughout her career, Karen Gordon Mills owned, managed, mentored, and invested in small and growing businesses of all descriptions. "For most of the eighties," recalls the unflappable mother of three and wife of a college president, "I was pregnant, walking through steel mills, and buying companies." Now working with small business owners on a national scale, she believes their job-producing sector is critical to rebuilding the US economy. A hands-on leader who has met with business owners in 36 states in the two years since President Barack Obama appointed her to head the US Small Business Administration (SBA), Mills has had many poignant encounters with people she calls "the builders of the American dream." From a Gulf of Mexico shrimp fisherman who stayed in business with low-interest economic injury loans after the BP oil spill, to a Pennsylvania drill bit manufacturer whose SBA-financed technology was instrumental in rescuing the trapped Chilean miners, to a couple whose Arkansas saw mill was saved by an SBA loan when the credit crisis hit, small business owners inspire Mills daily with their determination, she says. "The people we work with are tightly woven into the fabric of their communities," notes Mills, whose career has been influenced by her paternal grandfather, who came to the United States from Russia to build a textile business. "Half the workers in this country are employed in small businesses. We need to make sure they have the tools to grow their companies, create stable jobs, and move our economy forward." Mills serves as the 23rd administrator of the SBA, an agency founded in 1953 that has delivered millions of loans, loan guarantees, contracts, counseling sessions, and other forms of assistance to small businesses. She leads a team of 3,000 employees who help small businesses across the country. The agency also employs 2,000 on-call staff who work on disaster relief. Along with a portfolio of more than $90 billion in loan guarantees, the SBA is responsible for ensuring that 23 percent of all government contracts are awarded to small businesses. "That's $100 billion dollars a year," she stresses. Reflecting on her preparation for her current role, Mills says, "At MMP Group, I had the privilege of buying, owning, and advising businesses one at a time — investing in them in ways that would help them grow," she muses. "So when I walk into a small business today, I understand the issues very well." Karen Gordon was born in Boston. Her father (Melvin Gordon, MBA 1943) ran a textile business before taking over Chicago-based Tootsie Roll Industries, which he continues to run jointly with her mother, Ellen Gordon. After graduating from Harvard with a degree in economics, business school was the natural next step. "When I started reading HBS cases about efficiency on the factory floor," she recalls, "I felt like I was back at the family dinner table." Her professional DNA includes a consulting role at McKinsey & Company, a stint at General Foods, and considerable venture capital experience. 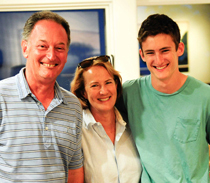 Gordon Mills with her husband, Barry, and son George. Mills finds working in the public sector to be extremely rewarding and is deeply committed to helping small US manufacturers who operate in large corporate supply chains. "We cannot lose their expertise," she emphasizes. "If we do, we'll lose even more jobs to competitors abroad." By providing mentorship and financing that ranges from micro loans to help home-based businesses buy delivery trucks to sophisticated loans to build factories, she believes the SBA can stimulate "not just initial product creation, but production innovation, manufacturing innovation, and the process that turns US inventions into US jobs." Mills's introduction to government service came while she was still working in New York but living in Brunswick, Maine, with her three sons and husband, Barry Mills, the president of Bowdoin College. 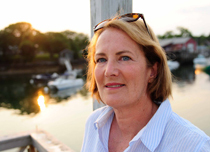 In 2007, she was asked by Maine's then governor John Baldacci to put her venture capital skills to work developing new jobs to soften the economic impact of a local Navy base closure. While she had no idea that entree would lead to working for the president and representing small business on Capitol Hill, saying yes to the challenge was in keeping with the increasingly nuanced career philosophy that Mills — who graduated from HBS at a time when women managers felt driven to follow the fast track to "having it all" — has come to embrace. "I've learned that the right next step might be an evolution, or it might be a new direction," she observes. "In the end, the best choices are those where you can succeed and help others to do the same."